This year’s theme for the International Day of Democracy is ‘Engaging Young People’. But why do older people need to sit up and take note, too? There is a global concern that young people are becoming disenchanted with politics; less trusting of those who are supposed to represent them and less likely to bother going out to vote. It is important to vote – not least because taking part in the decisions that affect our lives is the backbone of a thriving democracy. But this is is not an issue just for younger people; freedom of expression and the right to participate in our communities are two fundamental human rights that are routinely denied to older people. It is true that older people can be more inclined to vote than young people. However, it is not true that older people have more power. 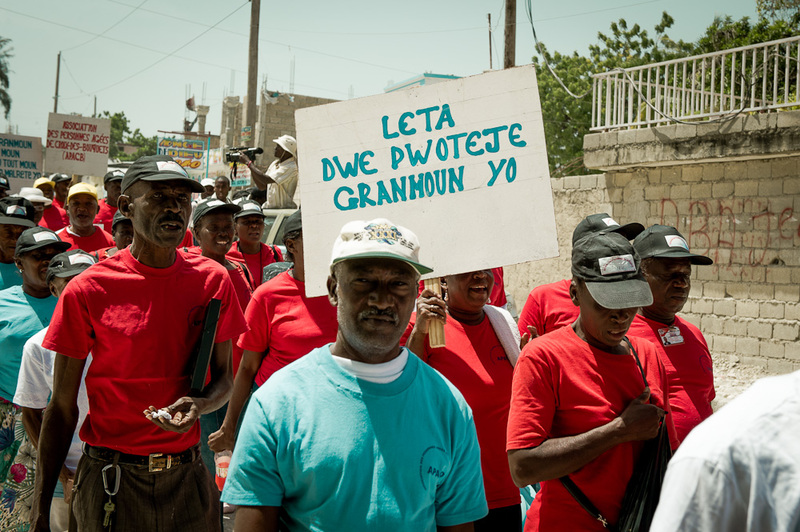 Many older people around the world are without pensions, without healthcare and without livelihoods. Policy-makers often write off the needs of older people and don’t make the effort to take their concerns into account. To have true democracy, we need to ensure that all people of all ages can take part. 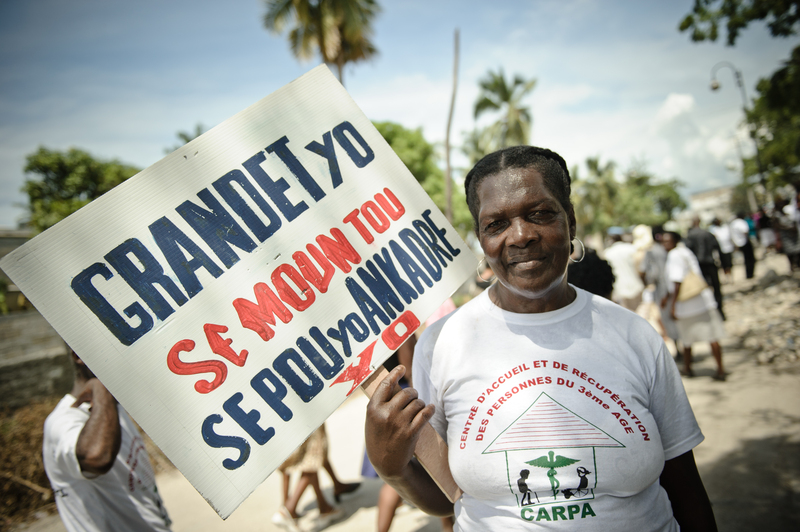 An older woman marching for her rights in Haiti. Of course, democracy isn’t just about elections. It is about people participating fully in their communities and driving their own destinies. Democracy starts small, within households and local communities. It is about people being equally valued, and equally empowered. Research shows that we are happier if we have control over our own lives, and if we feel part of the community. But people often find themselves isolated once they get older, and this can reduce their capacity to participate. Age discrimination also acts as a barrier. How can older people participate in democracy? One way to help is by setting up Older People’s Associations (OPAs) to provide mutual support and to create better visibility for older people and their needs. We support the establishment of OPAs in many countries. Some OPAs act as advocates for change, lobbying government ministers and making the case for better conditions for people in later life. Some provide community-level support affirming to older people that they have not been forgotten and that their voice can be heard. The need for older people to self-organise in this way is proof that much still needs to be done. Too many of the 810 million older people around the world are not just made invisible, they are silenced too. This is not what a democracy is built on. All over the world, we make assumptions about what individuals need – older and younger – or we just don’t think about their needs at all. Ask those individuals directly and you might be surprised by what they have to say.